This pasta comes together in just 30 minutes and tastes AMAZING! 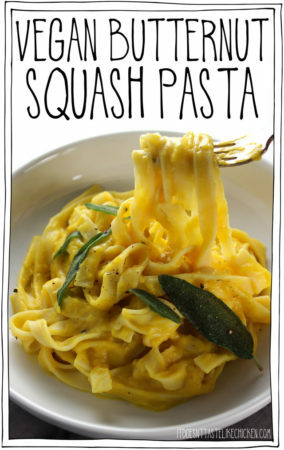 Butternut squash makes the pasta insanely creamy, then top with crispy fried sage leaves. You won't believe how simple this dish is to make but tastes like it's from a fancy restaurant! In a large saucepan, melt the vegan butter over medium-high heat. Add the onion and garlic and sauté for about 5 minutes until the onion turns translucent and begins to brown. Add the butternut squash, vegetable broth, salt, and pepper. Cover and cook 10 - 15 minutes until the butternut squash is very tender when pierced with a fork. Use an immersion blender or standing blender to blend the butternut squash mixture until it's completely smooth and creamy. If using a standing blender, be careful not to fill the blender too high so it doesn’t erupt. If your sauce is too thick, you can add another 1/4 cup of vegetable broth. Return the sauce the pan, and add the cooked pasta to the sauce and toss well to coat. To fry the sage: melt the vegan butter in a frying pan then add the sage leaves. Fry the sage leaves for 1 - 2 minutes until they stop sizzling so much, or the edges just start to brown, and they are crispy. Remove from heat and set on a paper towel or a clean dish towel to drain. You may have to do this in batches. Serve the pasta with a few fried sage leaves on top of each portion.